Gravenhurst’s best kept mountain biking secret. Discover Buckwallow today, with about 25 km of trails for every skill level. Not much change in elevation, but a variety of trails and difficulties from easy to extreme. Some good exposed rock faces. 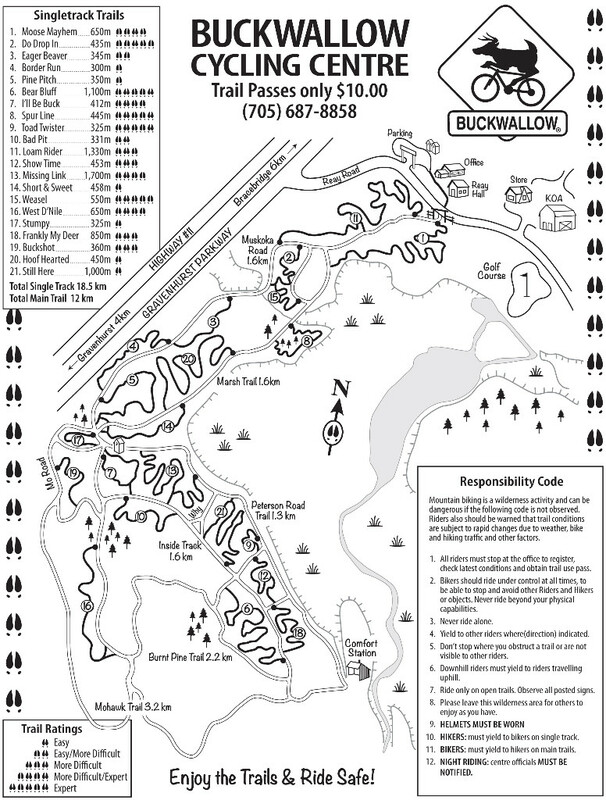 Great layout; main trail with loops and inter-connecting runs. Extremely well-maintained with a variety of challenges. A true Muskoka Experience for cycling enthusiasts. Join us on Thursday evenings in the summer for our weekly Buckwallow Mudslinger Race Series, brought to you by Angry Johnny’s Racing, Algonquin Outfitters and Buckwallow Cycle Centre. The trail head is located about 100 km east from Algonquin park just outside of Gravenhurst. From Gravenhurst take Hwy#11 North then turn onto Bethune Rd. Exit, turn right, take 1st left Gravenhurst Parkway, follow Parkway about 2km, turn right on Ray Rd. Gate for Buckwallow is on the left. Intermediate to Expert. Trail surface is rock, gravel, mud, sand, and roots. Lots of technical sections, some intermediate, some easy. Trail types: singletrack and doubletrack.